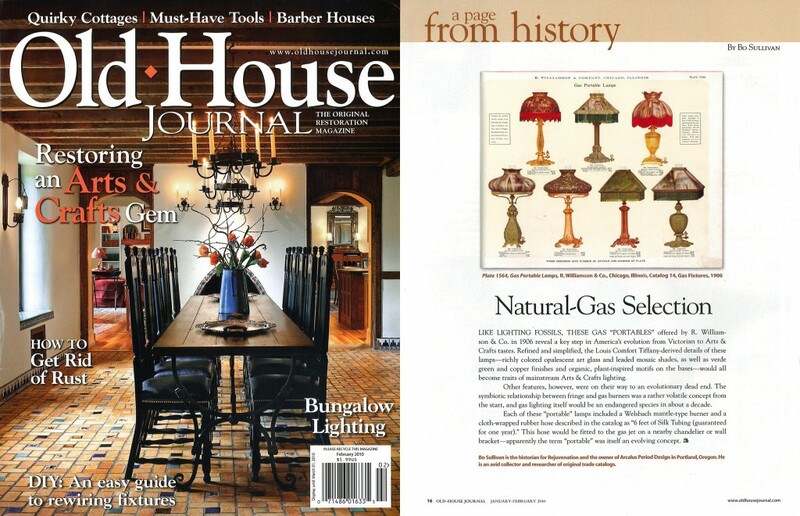 For four years from 2010 to 2013, Bo contributed a one-page feature for each issue of Old-House Journal, highlighting a rare or unusual page drawn from original trade catalogs in the Arcalus Period Design archive. An example of a published article is below, along with additional information about the topic. 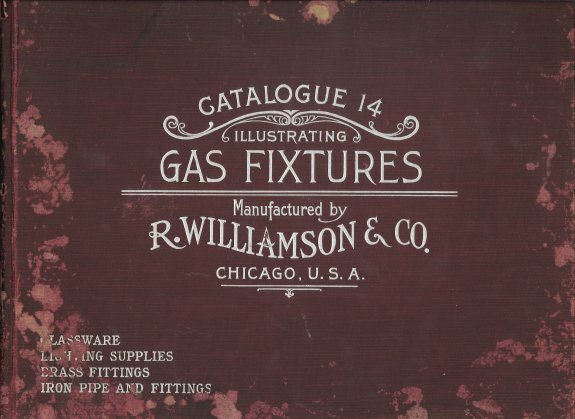 Like lighting fossils, these gas “portables” offered by R. Williamson & Co. in 1906 reveal a key step in America’s evolution from Victorian to Arts & Crafts tastes. Refined and simplified, the Louis Comfort Tiffany-derived details of these lamps’ richly colored opalescent art glass and leaded mosaic shades, as well as verde green and copper finishes and organic, plant-inspired motifs on the bases –would all become traits of mainstream Arts & Crafts lighting. Other features, however, were on their way to an evolutionary dead end. The symbiotic relationship between fringe and gas burners was a rather volatile concept from the start, and gas lighting itself would be an endangered species in about a decade. Each of these “portable” lamps included a Welsbach mantle-type burner and a cloth-wrapped rubber hose described in the catalog as “6 feet of Silk Tubing (guaranteed for one year).” This hose would be fitted to the gas jet on a nearby chandelier or wall bracket – apparently the term “portable” was itself an evolving concept. More on the story: Williamson No. 14 was a remarkable volume in itself. 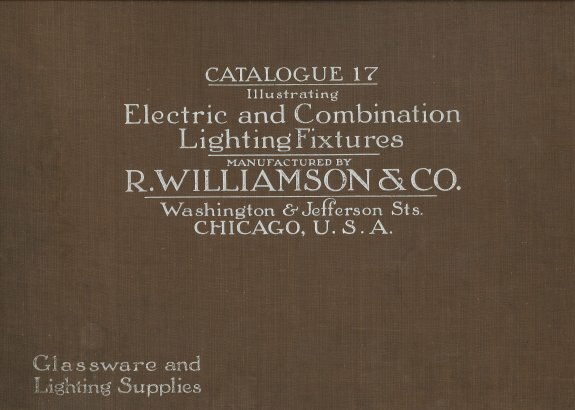 A whopping 12″ x 15″, this large hardbound book offered more than 160 pages of lighting fixtures, shades, and gas supplies. Most notable was the 16-page section of full-color plates like the one above, an extremely unusual and expensive feature for a lighting catalog of that era. In fact, a 1906 trade journal reported that No. 14 had cost Williamson “practically $30,000” – nearly three-quarters of a million dollars today. As amazing as it was, Williamson No. 14 would turn out to be just a warm-up for No. 17, issued five years later in 1911. 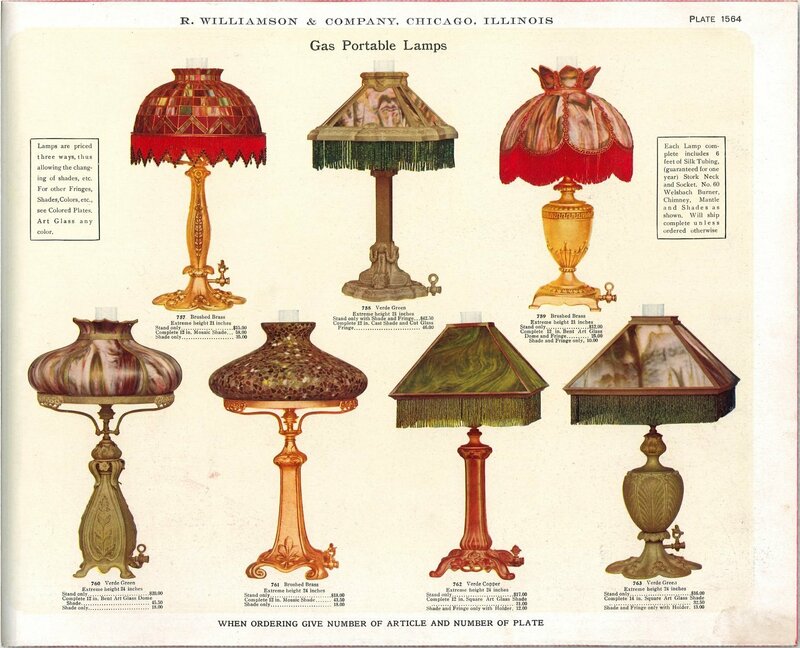 Arguably the most astounding American lighting catalog ever published, No. 17 would measure almost 14″ x 17″, weigh in at 10.5 lbs., be more than an inch and half thick, and consist of 396 pages (20 in full color).